Lock 'n Load: Noville – Bastogne's Outpost depicts the battle for Noville (December 19/20, 1944) on a 22" x 34" map created from actual maps of the period. There are six scenarios and 85 new counters drawn by David Julien, featuring tense battles between American tank-infantry teams against Panzer Grenadiers, Volksgrenediers, and Panzers of the Wehrmacht. 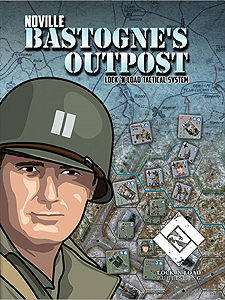 Note: Noville - Bastogne's Outpost is an expansion game for Lock ‘n Load Tactical's Heroes of Normandy, you must own Heroes of Normandy to play this game.